This year, when coloring eggs, I experimented with some natural Easter egg dye from vegetables and spices. The top row are various shades of blue from red cabbage on brown eggs (the left two) and white eggs (the right two). The second row are reds, pink and browns from onion skins and beets. From left to right: red from yellow onion on a brown egg, pink from beet juice on a white egg, brown from onion skin on a white egg and brown from onion skin on a brown egg. The bottom row are shades of yellow from turmeric. This method is more time-consuming and laborious than just buying a PAAS kit. The results are not instantaneous either. And the colors are not as exciting…but it is SAFER and HEALTHIER. I used onion skins, turmeric, beet juice, and red cabbage to get brown, yellow, pink, and blue eggs. The red cabbage worked out the best. Turmeric would be the winner because it made a nice yellow and it was the easiest to do. For all the eggs, be sure to refrigerate them as they are soaking in the dye, especially overnight. Roughly chop the cabbage. In a large pot, add water and vinegar. Bring to a boil, then lower heat. Cover and simmer for 30 minutes. Strain the cabbage and reserve the “dye.” Let it cool. Put it in a smaller pot or bowl so that it will cover the eggs. This should be enough for a dozen eggs, give or take one or two. These will take on good color in no time. I left some in overnight. The brown eggs are a deep bluish-green and the white eggs are a nice blue. If you soak them for only a few minutes, they will be a lighter blue. Skin the onions. Put onion skin, water and vinegar in a large pot. Bring to a boil, then lower heat. Cover and simmer for 30 minutes. Strain the skins and reserve the “dye.” Let it cool. Put it in a smaller pot or bowl so that it will cover the eggs (add a little water if you need to). Boil the eggs as you would for hard-boiled eggs. I brought them to a boil, then shut off the heat and let them sit, covered for 10 minutes. The color on brown eggs is very deep red. Leave in overnight for best color. I did not try these on white eggs because I ran out, so I want to do it again on white eggs. Now, if you don’t boil the eggs in the dye and just soak them in the onion dye, they will be brown, not red. Skin the onions. Put onion skin, water and vinegar in a large pot. Bring to a boil, then lower heat. Cover and simmer for 30 minutes. Strain the skins and reserve the “dye.” Let it cool. Put it in a smaller pot or bowl so that it will cover the eggs. Leave in overnight for best color. You can see the brown eggs are darker and more reddish-brown than the white eggs. Put all in a pot. Boil as you would hard-boiled eggs. I brought it to a boil, turned off the heat, covered it and let it sit for 10 minutes. Then, I rinsed them and let them dry. Add some water so that the juice will cover eggs. Soak overnight. OK, these don’t really get very pink. I want to try these again using fresh beets because the color is supposed to be hot pink. Stay tuned. On my visit to Rosa Mexicano’s Ice Cream Festival opening night, I got the ice cream selection. From left to right: plantain and peanut butter, honey-amaranth crunch and sweet cream with shaved Mexican chocolate and cajeta swirl. If you are a peanut butter lover, the plantain and peanut butter is very peanut-buttery. The sweet cream was a bit disappointing, as it sounded so flavorful with chocolate and cajeta, but it fell flat for me. My favorite was the honey-amaranth crunch, creamy and sweet with a little bit of crunch. I want to return to try the raspado and also the alegria ice cream sundae. Rosa Mexicano Ice Cream Festival, July 31, 2013, through August 25, 2013, local locations in Manhattan and Hackensack, NJ: Try homemade Mexican paletas, or ice pops; raspado, or Mexican snow cones; ice cream desserts like ice cream stuffed churros or ice cream and sorbet in flavors inspired by Mexican cuisine. Paper’s Super Duper Market, Friday, August 2, 2013, through Sunday, August 4, 2013, 11 a.m. to 4 p.m., 6 p.m. on Saturday, 268 Mulberry Street between Houston and Prince, Manhattan: Try artisanal food from around the country. Humphry Slocombe, San Francisco’s delicious ice cream, will be back this year, yum! I loved it last year. Brooklyn Flea’s Ice Cream Bonanza, Saturday, August 3, 2013 and Sunday, August 4, 2013, Williamsburg, Brooklyn: Try organic and interesting flavors of ice cream from Brooklyn and beyond. Lobster Bake Party, Sundays, 6 p.m. to 10 p.m., Hotel Chantelle, 92 Ludlow Street, Lower East Side: A weekly event through the summer. $29.92 per person for 1 whole Maine lobster, steamed little neck clams, baked red russet potatoes and corn on cob. The Billion Oyster Project, Tuesday, August 6, 2013, 7 p.m., Pier 6, Brooklyn Bridge Park: Take a look at the park’s oyster gardens and discuss the Urban Assembly New York Harbor School’s plan to put a billion oysters back in New York Harbor. Short Stack Eggs Bookbinding Party, Tuesday, August 6, 2013, 6 p.m., Kitchensurfing Townhouse, 456 Carroll Street, Brooklyn: Short Stack is a series of small-format cookbooks about ingredients. This party will feature Ian Knauer, renowned cookbook author and writer, who will prepare some of the recipes from his Eggs book while attendees stitch their own book. The NYC Taco Challenge, Thursday, August 8, 5:30 p.m. to 9 p.m., Studio Arte, 17th Floor, 265 West 37th Street, Midtown Manhattan: Tasting and judging of six different tacos. Hudson County Restaurant Week, through August 9, 2013, participating restaurants in Hudson County, NJ: Celebrate Hudson County restaurants with discounted prix fixe menus. New York City Restaurant Week 2013, through Friday, August 16, 2013: Celebrate NYC restaurants with $25 lunch and $38 dinner menus. How to Prepare a Korean Feast, Wednesday, August 21, 2013, 8 p.m. to 10 p.m., Brooklyn Brewery, Brooklyn: Learn how to make kimchi and shop for a Korean feast. Blues BBQ, Saturday, August 24, 2013, 2 p.m., Hudson River Park: Blues musicians along with Brother Jimmy’s and Dinosaur BBQ. 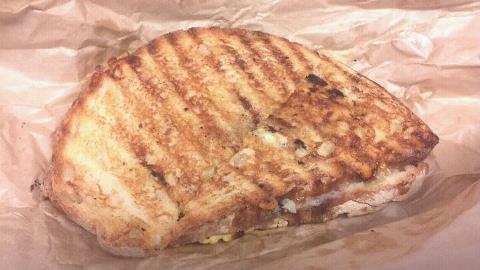 I got a really delicious eggs and cheese sandwich at Beecher’s in Flatiron. This is also a great breakfast/lunch for Lent! It’s on really good toasty bread. It’s more cheesy than eggy, which I would expect from a cheese shop!